It's been one hundred years since Albert Einstein first published his Theory of Relativity, and philosophers and scientists are still debating the consequences of that momentous event. Gabriel Emanuel's "Einstein," which premiered in Canada over twenty years ago, is certainly not the last word on this legendary figure, but it goes a long way towards bringing the man closer to those of us today who are badly in need of his wisdom. Israeli actor Victor Attar reprises the role at La MaMa E.T.C Dec. 7 to 11 in the one-man-show directed by Howard Rypp. He looks, talks and moves so like Einstein, it's almost as if the possibility that time is not only relative but also cyclical were true and the great man has returned to earth. The only problem with the show is that it is running for such a short time. The play takes place on the eve of Einstein's 70th birthday, before and after he receives an award from the Hebrew University in Jerusalem. The stage is set with two desks cluttered with books and a violin case, a blackboard covered with scribbled equations, a pair of shoes. The great man enters, barefoot and clad in a long-sleeved undershirt and pants held up by suspenders. He slowly dons a shirt, tuxedo jacket and shoes, although he doesn't put on socks because "they produce only holes." As he dresses, he ruminates on his friends, his family and his career. Thus with humor, insight and some bewilderment, Attar takes the audience on a journey through Einstein's life and work. Einstein recalls his problems in school: he was considered slow and expelled for asking too many questions. He remembers the time his father bought him a compass, which he found "the most magical gift in the world." Einstein talks of his love for music, even at an early age, but he does not play his violin for the audience because he cannot find the bow. Soon Einstein talks about studying at the university where he met his first wife and working in the famous patent office where he developed the first part of his Theory of Relativity. But even his great fame cannot protect this man whose religious beliefs were centered on his desire "to know how God created the world and whether he had choices in the matter" from the Nazi who remind him that he is indeed a Jew. Einstein flees to the United States where he is a celebrity besieged by newspaper reporters and manufacturers who want him to endorse their products. 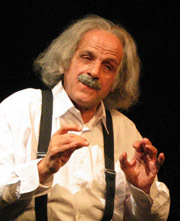 Throughout the play Einstein explains his theories. He apologizes to Newton for replacing his belief that time and space remain when everything disappears with relativity which says that time and space disappear along with everything else, and for proposing that gravity is not a force but a field. Of course there is Einstein's famous analogy of the two lights and the moving train and his conclusion that "Time is relative to the motion of the observer. One man's now is another man's then," his unsuccessful search for a unified field to explain how the universe works, and his belief, despite this failure, that "God does not play dice with the world." Einstein is filled with wonderful irony. He says that since the mathematicians have started explaining his ideas he's been having trouble understanding them. He acknowledges that his successes came at the expense of his relationship with his wife and children. He comments that "The scientists are the only truly religious people in this materialistic time," "To punish me for my contempt for authority fate has made me an authority" and "The most incomprehensible thing about the universe is that it is comprehensible." But perhaps the greatest irony in Einstein's life was that he, a pacifist, should have been the prime creator of the atomic bomb. Einstein says "There is not one idea of which I can be certain." His most profound uncertainty may have been about the future of the world in the Atomic Age. At the end of the play, Einstein predicts "The war after the next one will be fought with rocks." "God does not play dice with the universe," says Einstein. "And neither should we." "Einstein" triumphed at La MaMa, albeit briefly. At least we can see more of Mr. Attar. He returns to La MaMa December 14 to 21 in another one-man show, "Golgotha," a play about the Greek Holocaust that is presented with the assistance of the American Sephardi Federation. For more information, see www.lamama.org.